The new Giulietta is the third Alfa car of that name. Alfa Romeo's Giulietta compact is a key launch for the Fiat S.p.A.-owned Italian sports car brand, which has seen sales decline to 102,000 cars last year from 152,000 in 2006. The sporty hatchback will replace the 9-year-old 147 in Europe when it enters showrooms this summer. There are no plans to sell the Giulietta in North America. The Giulietta is the first Fiat Group vehicle to use the company's Compact platform, which will also be used in North America for new Chrysler, Jeep and Dodge vehicles due to launch in 2012-2013. The next Fiat Group car to get the platform will be the Fiat Bravo replacement after 2013. 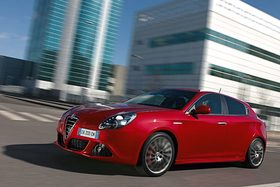 How is the Giulietta different from its predecessor? The Giulietta's Compact vehicle architecture features a new suspension system with aluminum arms to save weight. The car has nothing in common with the 147 it replaces, even its five engines -- three gasoline and two diesel units -- are new. All engines are turbocharged, part of Fiat's strategy to use turbocharging to downsize engines for better fuel economy without loss of performance. The Giulietta's 1.7-liter engine uses gasoline direct injection and turbocharging to deliver 235hp, a performance that Alfa previously offered with a 3.2-liter normally aspirated V-6 unit. Stop-start is standard and an option is a six-speed dual-clutch transmission that reduces fuel use by 10 percent compared with an automatic transmission. The Giulietta also has new electric power steering where the motor is mounted directly onto the rack-and-pinion case instead of on the steering column, increasing response and feedback. Who supplies the new technology? Brembo supplies the aluminum suspension arms, ZF the electric power steering, Robert Bosch the engine management system, Magneti Marelli front lighting, LED-based rear lighting and infotainment modules. The Giulietta will be sold only as a five-door car, although its predecessor, the 147, was offered in three- or five-door variants. Fiat did the same with the Fiat Bravo and the Lancia Delta models because the company sees demand for three-door cars is dwindling in the compact segment. Alfa says the top versions of the MiTo small car could satisfy buyers who want a more compact, three-door Alfa model. Launch date: May in Italy, followed over the summer by the rest of Europe except UK. Best bits: The Giulietta's rear-door handle is hidden to make the car look sportier. Alfa abandoned this feature on its last new model, the 159 sedan. The Giulietta's rear profile is simple and clean in line with classic Alfa cars. Young people and young parents who are looking for a distinctive car with lots of technology. Since the Giulietta comes only as a five-door, Alfa will be targeting familes more than with the 147, whose three-door variant was popular with single people.